This spacious 2 bedroom, 2 bath apartment is located within Rincon's beautiful beachfront Victoria del Mar Condominium complex built alongside popular Playa Corcega. It is tastefully decorated and furnished throughout with a sofabed in the Living Room; beautiful Queen Size bedroom set in the Master Bedroom; two twin size beds in the Guest Bedroom. 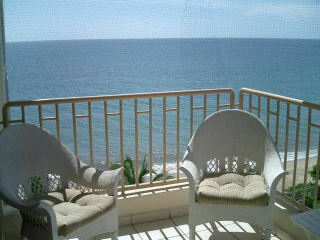 The apartment includes a large furnished covered oceanside balcony with spectacular oceanview. Rental includes use of the large oceanfront pool, gazebo, picnic area, and access to the beach. A 2 bedroom 2 bath condo with 1 queen bed in master bedroom, 2 twin size beds in second bedroom, sofabed in the living room, fully equipped kitchen, air conditioning throughout, ceiling fans throughout, satellite TV w/VCR and DVD, all bed and bath linens, washer & dryer combo, phone (local calls only), secure off-street parking, steps to the beach, located in the popular gated and secured community of the Victoria del Mar condominium complex in Rincon Puerto Rico. 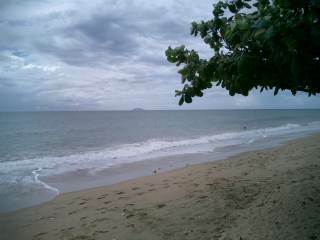 This Rincon Puerto Rico vacation rental apartment is located within the Victoria del Mar Condominium along beautiful Corcega Beach on the south of Rincon. The complex includes a gazebo and pool for your enjoyment. Victoria del Mar is located only a few minutes from downtown Rincon and close to Shopping, Restaurants, hospital, and all conveniences. The Rincon Nativo Sports bar is also nearby. Playa Corcega is a golden sandy beach suitable for swimming, snorkeling, sea kayaking, whale watching (in the winter), and other water activities.